but currently there is no usbfs file-system mounted/linked there to provide the 'devices' text-file. would making a symbolic link to /sys/bus/usb from /proc/bus/usb help or just screw everything up? alright, i take back my previous comment (i learned something new today). anyways, would it be possible for whoever maintains this package to add TJ's patch and update the repos? /sys/bus/usb/devices all the device-links are relative, and begin ../../../devices Unfortunately, in the /proc/bus/usb tree that takes us to /proc/devices which is a regular file and already exists - drat, foiled again! If other's can confirm this is a problem on 32-bit and 64-bit qemu and kvm I'll post apply the patch and post an SRU debdiff. I'm adding the sysvinit package to this bug-report since the changelog entry says applications should now use /dev/bus/usb, but it seems that usb is the only 'bus' using that location. Everything else uses /sys/bus/. Therefore it directly causes the qemu/kvm problem. It seems illogical to require all applications that access USB to be patched for this. There's a related bug report for VirtualBox with a comment by Scott, but no rationale to why it was done. Bug #151585 "USB Devices unrecognised by virtualbox (/proc/bus/usb missing)"
Support for /proc/bus/usb has been dropped because it is racey, and permissions are difficult to set -- compared with /dev/bus/usb which is maintained by udev and doesn't have these issues. Ubuntu is not the only distribution to have dropped it. If your software is using /proc/bus/usb, it is broken -- you've had over a year to change it, and you've failed to do so. Please change your software to use /dev/bus/usb now. I've rejected your sysvinit bug; this is deliberate and is definitely not a bug. Also your assertion about using /sys is entirely bogus - no devices exist under /sys. Scott, thanks for the explanation. When I'd re-aimed kvm at /sys/bus/usb/ I hadn't realised that it looks a for a file 'devices'. I thought it was looking for the base of a directory-tree containing the devices, which is what /sys/bus/usb/devices is. I'm not sure who is primary maintainer at Ubuntu - several people are listed as adding patches, and it's a MOTU package. I'm an end-user that wants the fix. I've withdrawn the previous patch and created patches for kvm and qemu that use /dev/bus/usb/ and attached the debdiffs for Hardy and Gutsy-proposed here. These patches fix an issue where qemu/kvm expects to find the USB devices file at /proc/bus/usb/devices and reports an error when started with the -usb flag as result. The location was changed in July as a result of a patch to sysvinit and is now /dev/bus/usb/devices. This is the kind of output to expect from the kvm/qemu debug shell (easily accessible when using qemuctl). The attachment is a screen-shot of qemuctl after doing Connect > USB > Renew. KVM Uploaded to hardy. Thanks. Waiting on patch refresh for qemu. We'd really prefer your original one-line patch to the new version (although qemu upstream would probably be interested in the new, general patch). We don't have to care about kernel backwards-compatibility :). Also, you have the wrong version numbers for your gutsy-proposed debdiffs. The versioning of SRUs are a bit different to normal development versioning. For these packages I'd suggest 0.9.0-2ubuntu4.1 for qemu and 1:28-4ubuntu2.1 for kvm. (One of the reasons for the different versioning is to make sure it doesn't conflict with the versioning in the development release - otherwise you could have a 0.9.0-2ubuntu5 in gutsy-updates and a *different* 0.9.0-2ubuntu5 in hardy). And there I was thinking packaging a bug-fix was a quick thing! So far I've spent 5 minutes creating the source-code patch and several hours messing about with packaging! Reported also for usbview in bug #151585. The three gutsy-proposed patches for usbview, qemu, and kvm look good, please go ahead and get them uploaded. Please upload them into hardy first, though. Are you sure that the patch for usbview is correct? I don't have a /dev/bus/usb/devices file here. I have only subdirs in /dev/bus/usb. The list that was /proc/bus/usb/devices is no longer available, either in /dev or in /sys. The information must be gleaned in another manner. Sorry, I've only applied the logic of the kvm patch, which should be invalid then, too!? Apparently I still have the "Magic to make /proc/bus/usb work" uncommented in /etc/init.d/mountdevsubfs.sh and the "ln -s .usbfs/devices /dev/bus/usb/devices" from there seems to create this file. It appears that for usbview the whole "LoadUSBTree stuff" would have to get rewritten to use the directory/filesystem layout instead of the the "devices" file. I'm not going to work on this though. My test of KVM worked with the patch: I don't believe it depends on the presence of the devices file. usbview may be different (I have not investigated this package). Emmet is, unfortunately, correct. I had forgotten to re-disable the section in /etc/init.d/mountdevsubfs.sh too. This could be added as an additional stanza (which takes the solution back to amending the "sysvinit" package). That, coupled with the alteration to KVM/QEMU would solve the issue. Emmet. I just realised you seem to be suggest it worked with the patch (for KVM on Hardy wasn't it?) but the patch simply replaces /proc/bus/usb/ with /dev/bus/usb/ but there is no 'devices' file link there *unless* the uncommented magic in /etc/init.d/mountdevsubfs.sh (or equivalent) has created a usbfs and linked /dev/bus/usb/devices into it. Is it possible the Hardy init is creating the usbfs and linking devices, or is there some confusion here? I have a Trust media center keyboard with builtin trackball. After a reboot, suddenly the trackball responded very sluggish, like with a ball-mouse (not optical I mean) with dirty wheels inside. But it couldn't be dirty yet, it is brand new. I noticed earlier that usbview did not work, but used to under Gutsy. I mounted the /proc/bus/usb filesystem, with mount -t usbfs procbususb /proc/bus/usb and instantly the trackball is working again. Usbview too. Whatever the thinking is about /proc/bus/usb, the change that was made to it broke my mouse (well trackball) and probably breaks the X window experience for lots of Gutsy users. Also there should be a better program than just usbview in Gnome to work with usb devices. usbview is very limited. And ugly. I followed this guide in order to use the debdiff file from TJ's post (qemu -2ubuntu5 gutsy-proposed debdiff ) : https://wiki.ubuntu.com/UbuntuPackagingGuide/BuildFromDebdiff. What could I have missed? Any help is appreciated. I shall say that a message telling "applying debdiff ..." when i was downloading the source called my attention. I do not see anything to do for ubuntu-sru here. Please get the fixes uploaded and tested in hardy, and attach tested debdiffs for the packages you think should be fixed in gutsy. Feel free to immediately upload clean and obvious patches like http://launchpadlibrarian.net/10207748/kvm_28-4ubuntu3-gutsy.debdiff without prior written approval. After that, please resubscribe ubuntu-sru. I was trying to use QEMU with USB in Ubuntu 7.10 Gutsy when I found this bug. I comment out the magic lines in /etc/init.d/mountdevsubfs.sh, started it, but still couldn't use USB in QEMU. Everything inside /proc/bus/usb/ and /dev/bus/usb was owned by root and QEMU couldn't read/write in it. I searched the web for something to change /dev/bus/usb/ and /proc/bus/usb/ permissions. QEMU docs says to "chown -R" all /proc/bus/usb/ and this was a problem since it "doesn't exist". 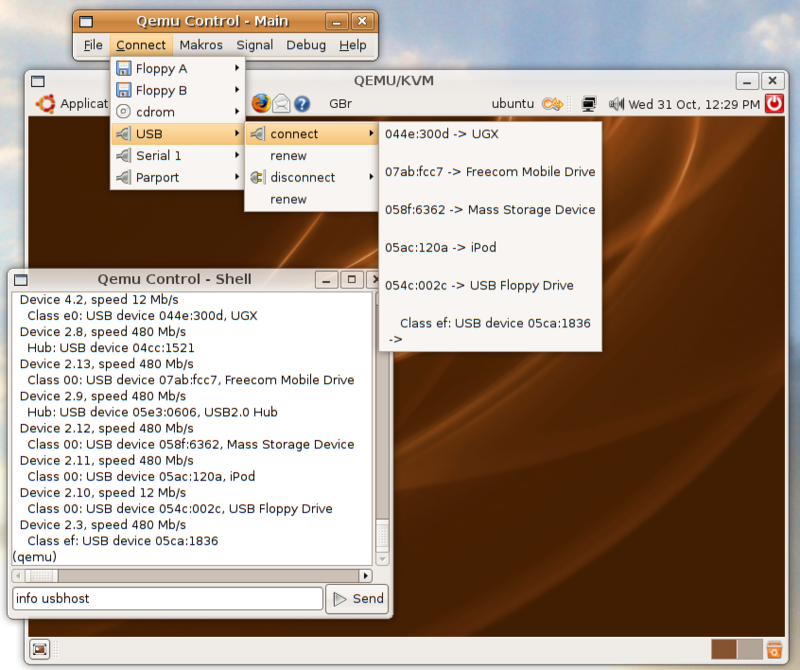 I found this: http://www.ubuntu1501.com/2007/12/installing-virtualbox-with-usb-support.html and adapted it to QEMU. # 128 is the GID of the group "usbusers". drwxr-xr-x 7 root root 0 2008-03-11 14:45 .
dr-xr-xr-x 5 root root 0 2008-03-11 14:46 ..
dr-xr-xr-x 2 root root 0 2008-03-11 14:45 .
drwxr-xr-x 7 root root 0 2008-03-11 14:45 ..
# Eject the USB device in Gnome before using QEMU! # Run QEMU with the option "-usb" or "-usbdevice host:1234:5678". This was the way I got this working 100%. Was there really no process during Gutsy (and Hardy nearly already) for these bugs? > compared with /dev/bus/usb which is maintained by udev and doesn't have these issues. It does not appear to be really frown to permission issues, because it links to the udev controlled interface. It has been marked deprecated for over a year in multiple Linux distributions, and has been removed by more than one. Code should be changed to use /dev/bus/usb. Curious if these proposed patch's have actually been applied to the qemu package in the hardy repository? As to date qemu still does not function properly. As far as I can tell, this also affects xsane for some scanners. I've a Canon Canoscan LiDE 60 that used to work fine in Feisty, but now doesn't get found. Since usbview is complaining about /proc/bus/usb/devices, I suspect the same issue. Seems like there's been a long trail on this one. Can we expect a fix soon? As someone who tries to promote Linux and Open Source, bugs like this really take the rug out from under us and send folk rushing to spend $100s with M$. attach /var/log/udev from that boot. > Which part doesn't work? > attach /var/log/udev from that boot. marked as a duplicate of this one. So do I need to upgrade to Jaunty to test? > > Which part doesn't work? > > attach /var/log/udev from that boot. > marked as a duplicate of this one. Logs from intrepid will be fine. I pulled the apcupsd and gapcmon sources for Gutsy, Hardy and Intrepid, and combed over them. As you say, no references. So I went back and re-tested without usbfs on both Hardy and Intrepid (I no longer have Gutsy handy for testing). To my chagrin (but not dismay :-)), it works. So you're right: I got caught by a documentation error, and did not try running it without first trying to meet the documented requirements, although even there the documentation is ambiguous enough that one can interpret it in multiple ways. In this case, RTFM might be construed to have a slight twist on the usual meaning. I've marked the apcupsd entries as invalid, and will open a separate bug for the documentation. By the way, I see that vmware-server is mentioned here. Has anyone tried VMware Server 2 (I am downloading it now, so I can take a look), or is this just about version 1? VMware Workstation 6.5.x has had no problem with USB devices on any of these versions of Ubuntu. As per Scott's request I'm attaching /var/log/udev from a boot with my Midisport device plugged in. contains the modern /dev/bus/usb path. LP: #156085.
device, rather than the first interface. LP: #156085.
work-around in the midisport-firmware package's udev rules? I just noticed a fix was released already. I will upgrade to Jaunty and verify that everything works for midisport-firmware. Dustin: could you look at QEMU, it should be the same basic patch as KVM right? I'm marking QEMU as 'fix released' as well. The relevant patch that we were carrying for kvm has been included in QEMU upstream, and is already present in qemu 0.10.0 in Jaunty. there is no vmware-server package in jaunty; marking this task invalid. The commented out magic in mountdevsubfs.sh was removed sometime after Hardy, probably because it didn't work anymore since domount no longer likes "" as a parameter. > likes "" as a parameter. Your problem sounds more like a bug in VMware and as it is a paid product I would ask them about it. It sounds like VMware is not passing the USB devices on. I contacted the developer of USBView and this is the dialogue. Please contact ubuntu about this, there is nothing I can do about it. /proc/usb is also needed for all users that use Aladdin HASP technology. What affects me is nautical chart subscriptions that require the HASP to work. These HASP keys will still be around for the next 10 years. So I feel that there should be a work-around for this. The work-arounds presented in this thread do not work because the domount command is also dropped together with all the mount-shell scripts from the initscripts packages. Karri: I can see at least two ways of solving this in more recent Ubuntus. One is virtualisation (e.g. VirtualBox with USB virtualisation, since that no longer depends on /proc/bus/usb :) ). The other would be a preloaded libary which emulated /proc/bus/usb while actually accessing /dev/bus/usb and sysfs. Much like the way that OSS was emulated in user space over ALSA. The second solution should also work for USBView by the way.